Situated on the outskirts of Alonissos Old Town, Villa Rotunda’s commanding position could not be bettered. The roof terrace affords incredible panoramic views across the Aegean, south to Evia, west to Skopelos, and north towards the Pelion Peninsular and Mount Olympus. A short stroll, leads to the enchanting cobbled streets of the Old Town, renowned for its character with narrow, winding, traffic-free streets with restaurants, tavernas, shops and a small supermarket. The villa is also conveniently around only 100 metres from the bus stop providing a regular link down to Patitiri and the harbour. This stunning house replicates a traditional Greek semi-circular stone tower and features a split-level design. 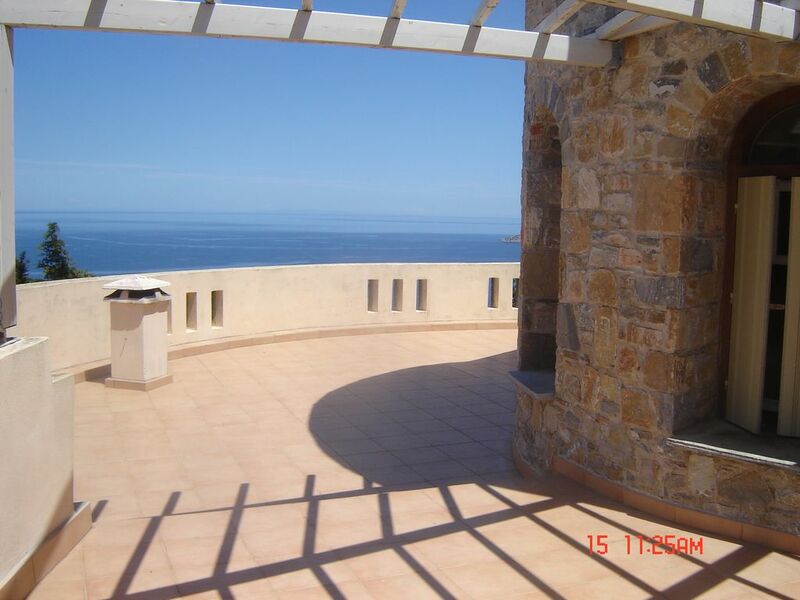 It is accessed from a path in the natural stone courtyard (300qm) which includes a pergola and barbeque. The front door leads into a large split-level living area with a raised kitchen and dining space. Large picture windows emphasise the curved walls and high ceilings of this spacious, well appointed room, with two sofas and occasional tables and a CD player. The room benefits from a large wood burning fireplace to provide a warm and welcoming atmosphere for ‘out of season’ guests. The comprehensively equipped kitchen includes a marble mosaic work surface, with all the usual appliances and features including a dishwasher to ensure a comfortable stay. From the kitchen double doors lead out to a west facing private secluded patio space for private dining. The ground floor bedroom is accessed from the main living area, featuring en-suite facilities and a king size bed. This bedroom has views north across the bay to the small island of Manola and the Chalkidiki peninsular beyond. Indeed, on clear days in Spring and Autumn when the heat haze has diminished, Mount Athos can be seen some 70 kilometres away. A spiral staircase leads to the upper floor which contains a further double bedrooms and shower room.The Tower/windmillroom could be used as a another livingroom or for sleeping . Both rooms afford far reaching views to the Pelion, whilst one bedroom in particular reflects the circular tower and allows access onto the spectacular roof top sun terrace. The large roof terrace is ideal for private sun bathing and lounging, whilst in the evening it is the perfect place to enjoy a relaxing chilled drink, star gazing and contemplating the night sky. Suitability: children welcome, limited accessibility, non smoking only, pets not allowed. please note that the price shown on the website includes max.4people for more people we charge 25 euro per night and person extra . En-site bathroom to master bedroom. 'Jack and Jill' bathroom to upper floor bedrooms. 200 qm sheltered, green courtyard with traditional kanapee with view to the sea. Great location, lots of interesting tavernas within a few hundred metres of the house as well as a supermarket for the essentials and a cash point. Beds could be more comfortable! This was one of the most beautiful stay ever in Greece! Alonissos is simply unique. We enjoyed all, from short treks to relax on well-organized sandy or pebble beaches, from fish tavernas to a modern and luxurious spa; Karl, the owner, is a super-kind person; the villa is beautiful (a real mansion, indeed, very cosily furnished and of architectural design), and very comfortable; the location is unique, with a breathtaking view. All shops and restaurant are in the proximity. The port is only 5' by car or 30' walking in the mediterranean bush. Beaches are from 5' to 30' by car, never longer. Super-recommended rent!!! L'acqua non è potabile. La lavatrice non c'è e gli indumenti li lava il proprietario con notevole difficoltà. Il frigorifero oltre ad essere piccolissimo è malfunzionante. Il forno elettrico non funziona. La cucina completamente sprovvista di utensili: è impossibile cucinarsi qualcosa. Il proprietario ci ha accolti con una serie infinita di divieti: non accedere in alcuni ambienti, non toccare i pochi soprammobili presenti, non aprire alcuni cassetti, non relazionarsi con i vicini con cui ha litigato... Ci ha lavato gli asciugamani riportandoceli la sera ancora bagnati: aveva solo quelli!!!! Ci ha richiamati per il troppo rumore alle 21:30 di sera mentre accanto alla casa c'è un locale che fa musica dal vivo fino all'una di notte. Infine l'aspetto più grave a mio parere, sono stati i ripetuti ingressi in casa da parte del proprietario quando noi non eravamo presenti. Fees shown are for 2- 4-person occupancy, for 6 people please add 20 Euros per night from the fees stated.